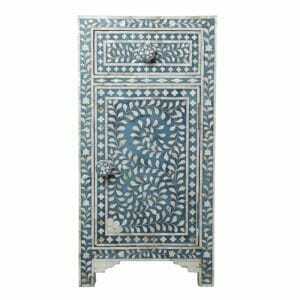 We hope you enjoy exploring our online catalogue and the many varieties of fine genuine Indian furniture that we have to offer at Iris Furnishing. Our bedside tables are one of our most popular lines because of their versatility, beauty and practicality. 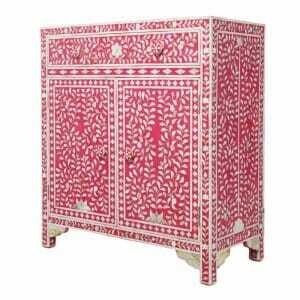 We offer a wide range of genuine Indian bedside tables, all crafted following traditional Indian techniques by our highly skilled woodworkers in Rajasthan. 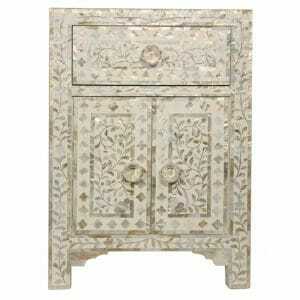 Where Can I Find Beautiful Wooden Bedside Tables? 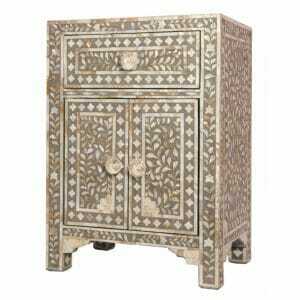 We feature one of the largest selections of bedside tables, all stunningly hand crafted in India and available in a range of decorative, ornamental finishes, from mother of pearl or camel bone inlay, to distressed wood finish as well as embossed metal or painted wood furniture with traditional Indian designs. 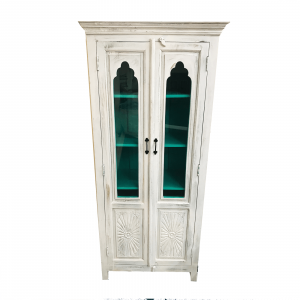 So whether you are looking for the highly ornate or the simply minimalist, we can offer you something for every home style. 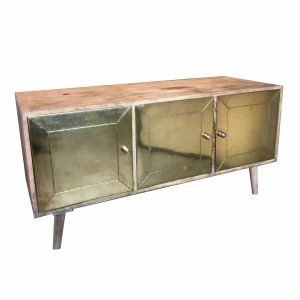 What we don’t currently have in stock can be ordered and we offer a luxury, bespoke furniture making service at no additional cost, so anything you can’t find in our collection can be hand made for you in India and delivered to your door. The Bedside tables are made of superior strength hardwood throughout with solid woodworking joints and superb carpentry, using traditional and modern methods, well integrated for the best quality bedside tables consistently manufactured to high standards. 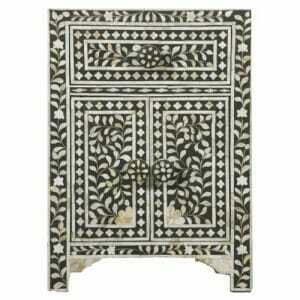 Typically made for India’s wealthy elite and commissioned by Royalty, these designs withstand the test of time and use. We're based in Brighton, Sussex and have a showroom here where you can arrange a viewing by appointment. We deliver in the UK and Internationally and use drop-test standard couriers. 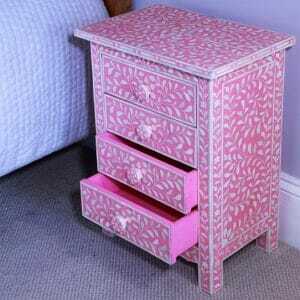 Can I have my Bedside Table Made To Measure? Because we know that every detail matters and want you to be able to relax and enjoy furniture that suits your needs exactly, we offer a free bespoke furniture making service, so your bedside tables can be hand made to the perfect height, width and depth to satisfy your exact specifications. 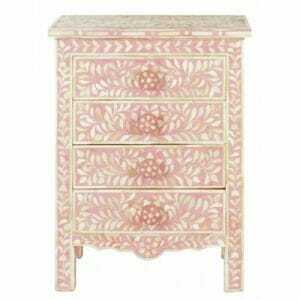 Perhaps you need the drawers to have a certain capacity, or the cupboard to have the right height, or an extra shelf. 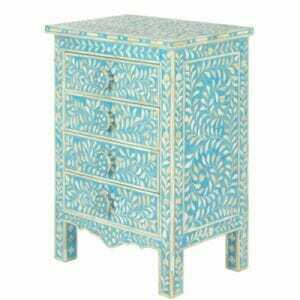 Maybe you saw the perfect colour and pattern on one of our other pieces of inlay furniture and would like that colour and pattern on a bedside table. Or perhaps these bedside tables are part of a matching furniture suite and you would like to have a dressing table made to order or a wardrobe made to match. 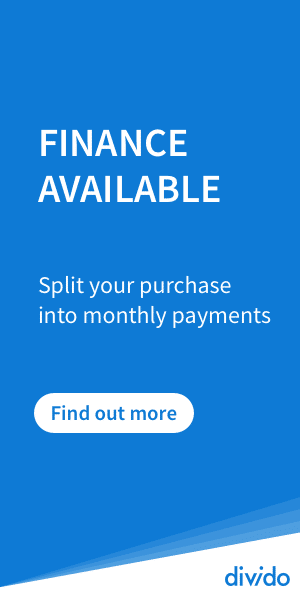 Just let us know your requirements and we can offer help and advice on any part of the process. We also offer bespoke inlay, painted or embossed metal accessories to be made as part of your set, so if you would like an small box made to match, or something more specific, let us know and this can be done for you. Who Makes Luxury Bedside Tables? 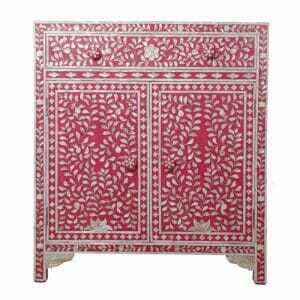 These beautiful tables are made by the master craftsmen who continually hand fashion beautiful tables, cabinets, cupboards and other graceful examples of Indian art-embellished furniture as part of their never ending passion for creating all things beautiful. With the extraordinary physical attractiveness that comes with good design, beautifully crafted and finished to perfection, the solid hardwood Indian bedside table offers a long-lasting piece of furniture that can be well used by all the family. The attention to detail defines the quality feel of these bedside tables. 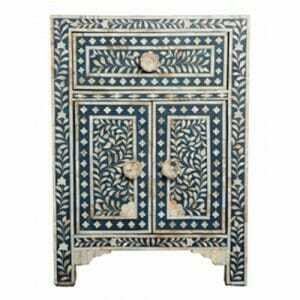 Those finished in Indian inlay are painted inside to match the exact colour of the resin and are set with matching handles, whereas metal embossed bedside tables can be made with blue or black interior lining in velveteen. Mother of pearl and camel bone inlay offer a shimmering elegance and embossed metal bedside tables reflect candle light with aplomb, enhancing the atmosphere of a room with opulence and a sultry elegance. 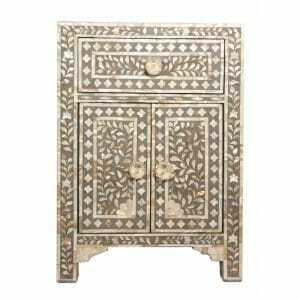 All these rich, ornate furniture patterns give a finish that reflects a wealth of class in a stylistic choice which suits everything from sumptuously indulgent furnishings to minimalistic interior décor. 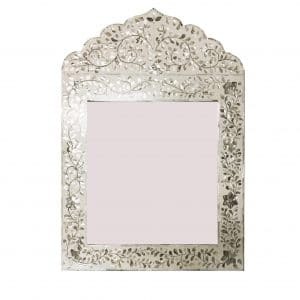 They make excellent feature pieces in living rooms and bedrooms, especially when matched with an inlay mirror and are popularly used as display pieces. 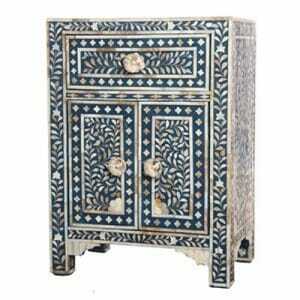 Looking For Truly Unique Artisan Bedside Tables? 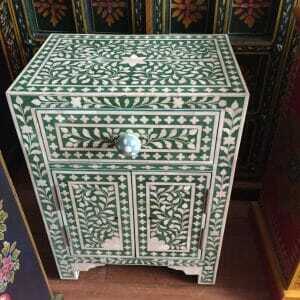 We sell original, authentic, carved, painted, embossed and inlaid ornately decorated wooden bedside tables. The skilled workers who've mastered these region-specific handicraft techniques aren't just manufacturing furniture. 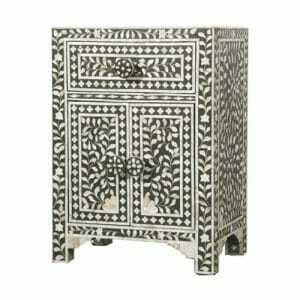 Every item is approached as a fresh creation and put together with all the care, enthusiasm and passion that a work of Indian art engenders, resulting in a unique hand crafted bedside table expertly made by master craftsmen. 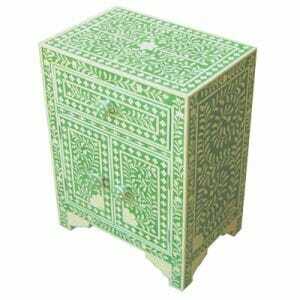 Centuries of finely attuned craftsmen’s secrets are applied in a process that preserves tradition while allowing for inspiration in the innovative designs infiltrating the ornate artwork on these highly ornamented bedside tables. 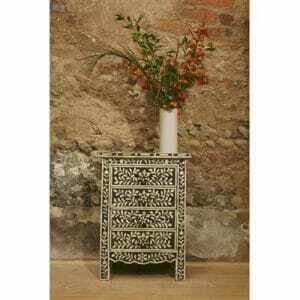 Geometric shapes border floral patterning and everything from stars to vines decorate fine Indian mango or sheesham wood in our selection of hand made bedside tables. 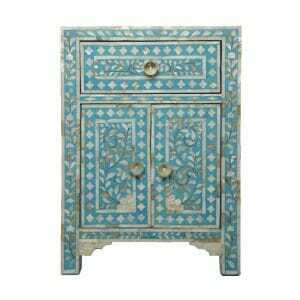 Of course, if you prefer contemporary design and just want to take advantage of the superior quality of Indian wood furniture, with its strength, solidity and renowned longevity, then a distressed wood finish can be yours in a variety of colours, from the simple white sheesham wood bedside table, to the muted greens or blues of the ocean. Our artisans love an opportunity to make something original, always surprising us with new designs, so if you have something you’d love to have made for you, have a look at our website, get inspired and get in touch with your ideas for your perfect piece of artisan, hand crafted Indian furniture. We know what can and can’t be done and we can translate your requirements to the artists in Rajasthan who will be happy to create for you. 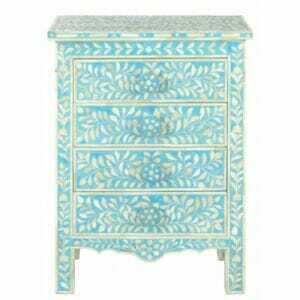 Have a look at our teal star bedside chest or the midnight blue hexagon inlay cupboard alongside our more traditional white mother of pearl bedside tables and know that all our pattern and furniture designs are interchangeable and can be made to measure. So you can co-create with our teams of incredibly skilled craftsmen to have your dream furniture designed and made. 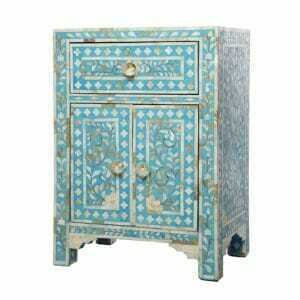 Where Can I Find Colourful and Unusual Bedside Tables? We love our soft, sophisticated greys, blacks and white bedside tables but we adore our pinks, greens, blues and purple bedside tables too! With different tones of every colour and the varieties that come with the different inlay styles, there’s so much to choose from and more than you can see in just the bedside tables in our collection. 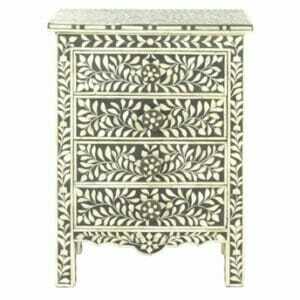 For a full range, have a look at our other inlay furniture and our painted furniture and really let your imagination run riot before you decide on your final design because our Indian bedside tables can be made in any colour you can see on our inlay furniture collection, with any pattern you can find here that you like. 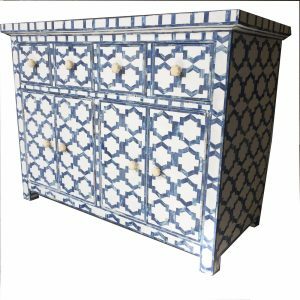 They can come in painted patterns with their dazzling colour combinations and hand painted to order for you or chosen from our extensive collection of bedside chests. 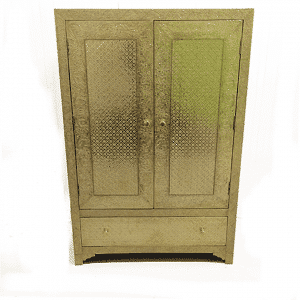 And as if that wasn’t enough to choose from, we have a range of metal embossed furniture that can all be made to order as a bedside cupboard, with soft interior lining and a wide choice of patterns. 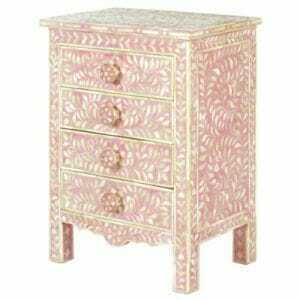 However, we think that the collection of colourful, beautiful bedside tables we have here on our website will probably have something for everyone. Don’t hesitate to get in touch with your questions and for all those little details that mean so much, call or email us. We’d love to hear from you and we will be more than happy to help. 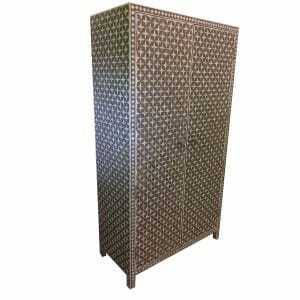 Our furniture is fairly traded and ecologically made with ethically resourced and sustainably harvested materials. Very happy customers! 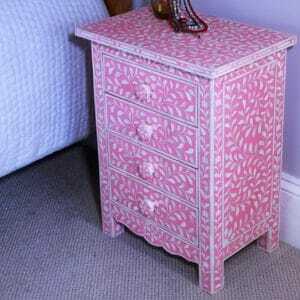 Bought a 7 drawer inlay chest of drawers. It's stunning and service and staff fantastic! Will buy again. Beautiful objects from India. Much care goes into the making and sourcing of all their goods. Easy access. Friendly staff. Great Service. Found these guys online and went to the shop and found some beautiful pieces. When I originally started to look for some Indian inspired furniture for our house, I was halfway over to Lahore before I found the koh-i-noor of a company that is Iris Furnishing. The fact that this is a UK based company which ships in from India had me enraptured, and then when visiting their site I almost exploded with wide eyed happiness. 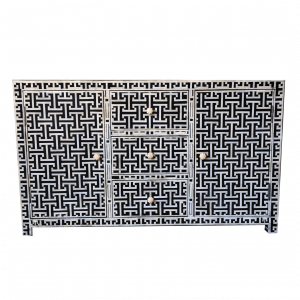 The White Metal Embossed Sideboard we purchased is magically constructed, a frequent point of discussion for any guests and is a beautiful enhancement to all rooms. The service we received from the chaps who ran the company was top class, and I only wished I was at home when they delivered, to thank them personally. Do yourself a favour and buy something from Iris, it would turn your house into a Mahal. 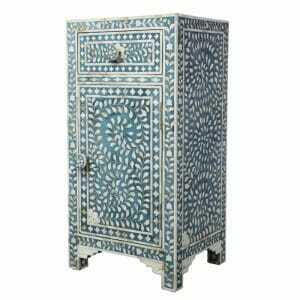 Iris is an independent retailer of fine Indian furnishings. 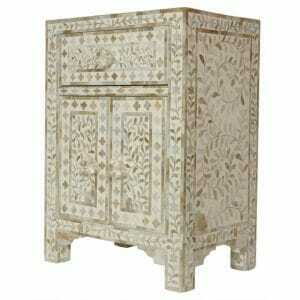 We have genuine passion for Indian furniture rooted in our 20 year love affair with the region. Copyright 2019 © Iris Furnishing Ltd. All Rights Reserved.